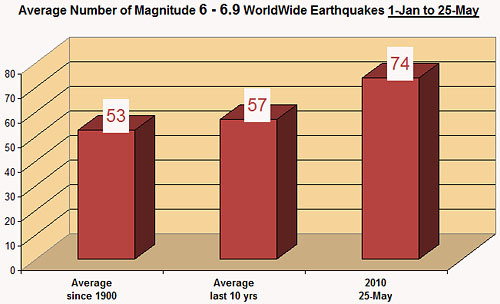 Earthquakes rise 51 percent this year - a sign of the soon return of the Lord Jesus. Why Are 2010 Earthquakes Up 51 Percent? 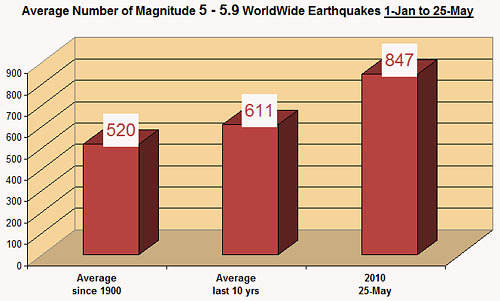 The number of magnitude 5.0 to 6.9 worldwide earthquakes are showing a significant increase so far this year during 2010, and are up 51 percent compared with the same range and time span of earthquakes since the year 1900, as of this independent analysis, 25-May-2010. Earthquakes of magnitude 5 – 5.9 have increased by 39 percent (139% of normal) compared with same range of earthquakes over the last 10 years. 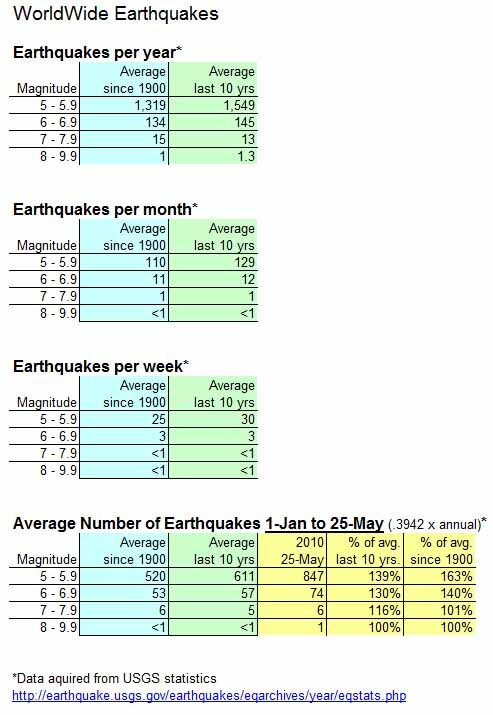 Earthquakes of magnitude 5 – 5.9 have increased by 63 percent (163% of normal) compared with same range of earthquakes since the year 1900. Earthquakes of magnitude 6 – 6.9 have increased by 30 percent (130% of normal) compared with same range of earthquakes over the last 10 years. Earthquakes of magnitude 6 – 6.9 have increased by 40 percent (140% of normal) compared with same range of earthquakes since the year 1900.